This experiential science museum gets over 500,000 guests each year. Part of that happens during their popular Space Out Weekend event. This is where Dennis Bateman, Director of Exhibit Experience and Theaters, brought Landmark Creations into the picture. "The giant inflatable astronaut was purchased to add some ‘Ooomph!’ to our annual Space Out Weekend, which draws thousands of visitors each year to an array of astronomy-related programs, displays and activities." During this amazing event, kids (and adults) were invited to examine sunspots and make craters, take a guided tour of the night sky, talk to real NASA employees, make (and eat!) planet cookies and more. 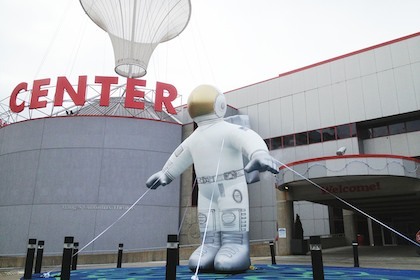 Dennis explained, "This year’s event was the highest attended in some time, and the [inflatable] astronaut, front and center on our Portico, was a great visible draw from all over the area." The good price, rapid service and interesting design concept were all reasons Dennis chose Landmark Creations. The results from the Space Out Weekend were so good that the museum decided to continue the use of this cold-air inflatable character permanently in their SpacePlace exhibit. Let's talk about what an inflatable character can do for you!